The City of London, also known as The City, or The Square Mile (after its approximate size of one square mile or 2.90 km2), is the area of London that originally lay within the ancient city walls. This part of Central London is not as big a tourist destination as the West End, Westminster or South Bank, but is a must for anyone wishing to explore and understand London. The Romans conquered Great Britain (the island that involves Scotland, wales and England which does not include Ireland) and merchants established a trade centre named Londinium next to River Thames in 50 AD. Not much time passed until Londinium was invaded for the first time by a Celtic tribe queen named Boudicca who led an uprising against the Roman invasion. The queen was defeated and the city had to be rebuilt, this time with walls. It grew prosperous and became the largest settlement in Roman Britain by the end of the 1st century. By the beginning of the second century, Londinium became the capital of Britannia (Roman Britain). The prosperous days of Londinium lasted for almost a century. In this century, the Romans built the London Wall which protected the city for centuries and decided the boundaries of the city and a bridge across Thames. At its best times, the Londinium had 45,000 – 60,000 inhabitants. Then came the times of instability for the Roman Empire. Londinium struggled with fires and plagues like the Roman Empire itself. Finally, in 410 AD, the Romans withdrew from Britannia. After their withdrawal, Londinium was almost uninhabited, if not completely. The economic centre shifted to the west, to Lundenwic with the Saxons settling in Britain. During the Anglo-Saxon Heptarchy – an era of England being ruled by seven Kingdoms, all Anglo-Saxons, eventually unifying into the Kingdom of England – Londinium came under the rule of Essex, Mercia and later Wessex. In the 9th century, the King of Wessex, arguably the first king of England, conquered Londinium but did not invade it. Abandoned city returned alive. This also protected Londinium from the raids of the Vikings. The City is on Rise, again in the 10th century. The king permitted eight mints (money coining factory, like money printing factory nowadays) to be opened in “London”, as Anglo-Saxons called the city then. The trade and population moved back to London, leaving an abandoned Lundenwic behind. Everything was fine until the Duke of Normandy William Ist launched the Norman conquest of England in 1066. He managed to conquer the area around London but didn’t invaded London, hidden behind its ancient walls. London accepted to recognise him as the King and to use the Kingdom’s currency and in return, kept its authority. Of course the King never trusted the City of London and built three castles nearby to pry into the city. (The Tower of London, Baynard’s Castle and Montfichet’s Tower). Eventually, the relationship between the Kings and the City progressed. In 1130, Henry Ist granted a sheriff to the people of London, then a Mayor in 1189. Henry Fitz Eylwin was elected to be the first mayor. Although London grew from this area, the official City did not change in size and the borders of the City of London have barely changed in centuries (they still follow the line of the old city walls to a great degree). The walls around the city, have now largely disappeared (several vestiges still remain, one of the largest of which can be seen outside the Museum of London, another just near the Tower of London) but various place names and streets hint at their prior existence. Locations such as Aldgate, Bishopsgate, Ludgate and Moorgate mark where the main gates were in the city walls. All the city wall gates have been destroyed now, but there is one restored gateway (it is however not one of the city wall gates) to visit: Temple Bar. This was located at one of the "bars" to the City, originally on Fleet Street, but now located between St. Paul's Churchyard and Paternoster Square. In WWII, aerial bombing, combined with the Second Great Fire of London destroyed most of the city, including many historical buildings. As they say every cloud has a silver lining, this had a bright side too. Major rebuilding programmes resulted with the City of London becoming one of the most modern places in the British isles, also the first one to have a skyscraper in Europe. The City of London is not a London borough and has an ancient and unusual local governance, with rights and privileges greater than those of anywhere else in United Kingdom. 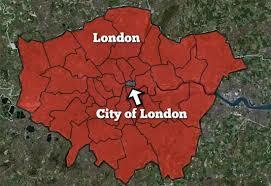 The local authority is the City of London Corporation and the chief position is the Lord Mayor. Whilst the rest of London has the Metropolitan Police, the City of London has its own police force. The City of London does not include Tower Bridge or the Tower of London, they are in the London borough of Tower Hamlets. A number of bridges over the River Thames do connect the City with Southwark and the two oldest of them, London Bridge and Blackfriars Bridge, are unusual in that the City of London's boundaries include the whole span of the bridge (the border otherwise runs along the middle of the Thames). Small statues of Dragons (sometimes described to be Griffins) mark the boundary of the City on most roads. 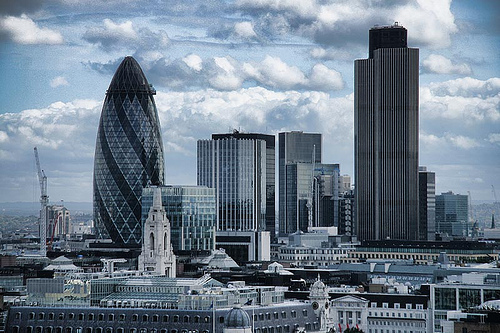 The City is the world's leading centre of international finance. In British parlance, The City often refers to the financial sector, just as Americans might refer to Wall Street. This area contains 255 foreign banks, which is more than any other financial centre. It also is home to the Bank of England and houses other institutions such as Lloyds and the London Stock Exchange. Every weekday approximately three hundred thousand workers come into the City to work in small and large business and financial institutions. The City has a very small resident population which, despite a recent increase, is little more than 8,000 people. At weekends the area can resemble a ghost town, with empty streets, closed shops and cafes. Another thing to note, is the high concentration of churches within the Square Mile. Historically, there was over 100 (ward) churches, but many burned down in the Great Fire of 1666, many (including St. Paul's Cathedral) date from after this fire and are built in 'English Baroque' style by the likes of Sir Christopher Wren. Due to the massive decline in population within the City, most are now eerie temples of silence, are have been converted over into art or creative spaces. Visit the City during the week because few shops and restaurants are open on the weekend, although this is changing. There is a new shopping centre called "One New Change". It is hard to believe how dead the area is at the weekend. It seems like the movie 28 Days Later. This could be a blessing if you want an easily accessible respite from the chaos of the West End to wander around the place at your own pace, admiring the architecture and character of the streets and buildings! You may also come across the filming of a TV advert, TV programme or even a film at this time. On weekdays, its streets are thronged with hundreds of thousands of workers but at weekends, it's dead. Only 8,000 people live here, and the tourists stick to just a handful of streets. The weekend, then, is a magical time to explore this ancient area, when you can easily find yourself all alone among the historic buildings and gleaming towers. The Lord Mayor of London is to be distinguished from the Mayor of London; the former is an officer only of the City of London, while the Mayor of London is the Mayor of Greater London and as such governs a much larger area. The office was instituted in 1189 with the first holder of the office being Henry Fitz-Ailwin de Londonestone. 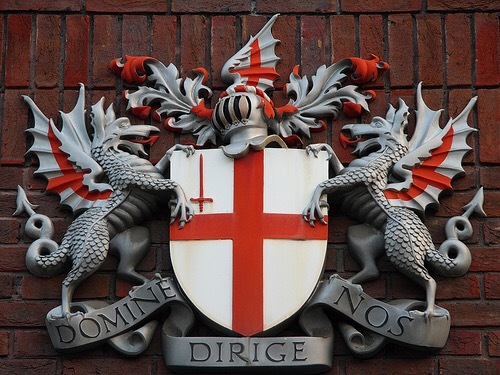 The Mayor of the City of London has been elected by the City, rather than appointed by the Sovereign, since a Royal Charter providing for the same was issued by King John in 1215. The title "Lord Mayor" came to be used after 1354, when it was granted to Thomas Legge by King Edward III. Lord Mayors are elected for one-year terms; by custom, they do not now serve more than one consecutive term. The Lord Mayor is elected each year at Michaelmas 'Common Hall', and takes office on the Friday before the second Saturday in November, at 'The Silent Ceremony'. On the day after taking office, the Lord Mayor's Show is held; the Lord Mayor, preceded by a procession, travels to the Royal Courts of Justice on the Strand, Westminster to swear allegiance to the Sovereign in the presence of the judges of the High Court. The position is unpaid and apolitical. which gives added credibility at home and abroad when representing the financial sector. The Lord Mayor spends some 90 days promoting the City abroad and also makes a number of business-focused visits to different parts of the UK. He addresses in the region of 10,000 people each month, making around 800 speeches a year.The Lord Mayor also hosts a large number of visits by important foreign political and business figures. Another key aspect of the Lord Mayor's role is to advise the Government on the views of City businesses. The residence of the Lord Mayor is known as Mansion House. The creation of the residence was considered after the Great Fire of London (1666), but construction did not commence until 1739. It was first occupied by a Lord Mayor in 1752, when Sir Crispin Gascoigne took up his residence in it.